What the Heck is a MicroSpud? Yeah I know, it's the one big question on everyone's minds these days... :p :D To fully understand the thinking behind this piece you'd have to see an original and I'd prefer to show that in a video because it's pretty unbelievable. I'll try to get a clip up soon. I actually have a batch of these cut and am starting work on them this week coming so they will not be far off. I got a few more ti RingTools done. 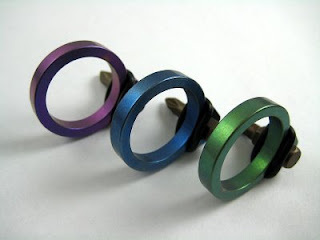 These are the same size 12 as the previous ones and are all anodized green. Green ti rings are gone for now, thank you! I am working feverishly on a bunch of other projects right now. Ti Atwrenches are at the tumblers right now and should be back by end of next week if all goes well. Other upcoming projects include the MicroSpud, details of which are coming soon. 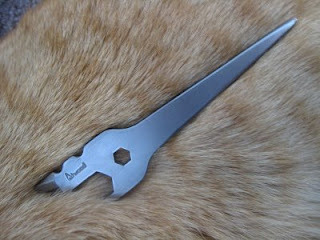 Also coming is the Shiner, a keychain tool. And I have a small batch of some simple non functional decorative titanium Keyfobs. I also have finally started a small keychain knife called the Fixer which has been planned since last summer and is now in the first stages of work. Huge batch of those are coming. February and March will be very busy! More lotteries coming up with a few more blades so please stay tuned for those as well..
5 HoopleHead - the Grail! Thank you folks! I will send emails out to the winners right now. Have a great rest of the weekend everyone. I finally got some more DLC MSOPThings done and decided to do them all with the black cord wrap for the cool blackout effect. I'm sorry I did not have any black bead chain on hand so it would be a total blackout look even with the kydex sheath but I'm sure the winners could scrounge some up if they look around. Anyhow, I have 9 of these and they are $185 plus $10 shipping in the USA or $25 shipping for International Express Mail. The lottery is over! Thanks for the interest and enthusiasm folks, I sure do appreciate it. I'll send emails out to the winners shortly. Thanks for participating folks, I appreciate it. I have more odds and ends I'm about to finish so there will be another lottery in a day or so. I have some larger batches of tools in the works as well and they are rapidly nearing completion so some general sales are coming up soon too. Happy Friday Boys and Girls! 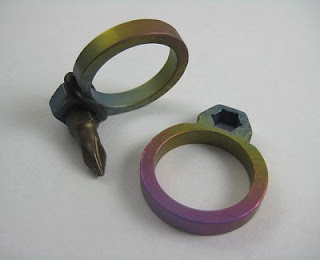 Here's a little batch of ti RingTools that I have done up with my Helter Skelter patterning and then anodized with Spectrum anodizing. They came out pretty nice I thought. ;) Same size as the previous ones, size 12. Anyway, these are being offered via the Lottery. I have 12 of them and they are $45 each plus shipping. The Lottery is over. Some may recall that I had to buy a new computer last summer thinking that my old one was about to kick the bucket. Well, it kept hanging on so I kept using it and putting off setting up the new one....until this past weekend when the old one just refused to boot up. So I spent the last three days getting used to the new machine and rebuilding my business files and everything else. Luckily I had backed up most of my important files so very little was lost. What a pain but at least I'm through the worst of it and almost all back to normal. Taking a bit to get used to a new keyboard, Vista, etc. Will be getting back to work in the shop tomorrow. Lot of new stuff is in the early stages right now. More news coming soon. I have completed the first wave of Ti RingTools. 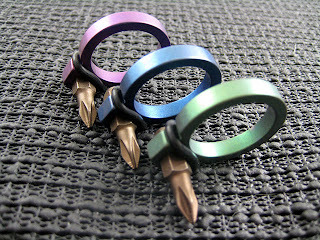 These are all stonewash finished and anodized. I will be offering three colors: Green, Blue and UV. Each comes with extra o-rings and a #1 Phillips bit insert. Price will be $35 plus shipping. All three colors are sold out! Thank you folks. Am already starting a second batch so probably will have more in a few weeks. Lucky number is 86, PK! Thanks very much folks and will have more of these lotteries in the next day or two. Howdy folks! 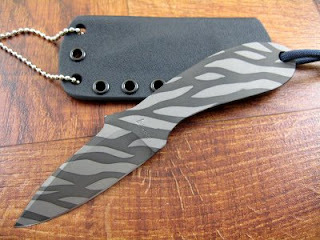 Just got the sheath done for this one and I thought it would be a nice way to kick off 2009. 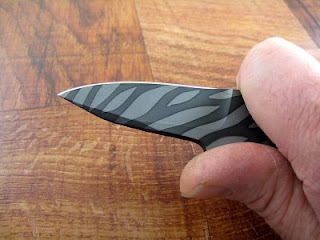 This is a one of kind, hand made neck knife with V ground blade. 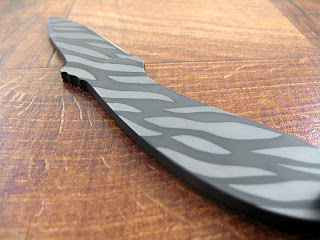 It is 5/32" thick S30v steel with approximately 2 inch cutting edge and about 5 inches OAL. It has DLC coating with high contrast jungle patterning. I decided to call it the Bird of Paradise which kind of suits it. 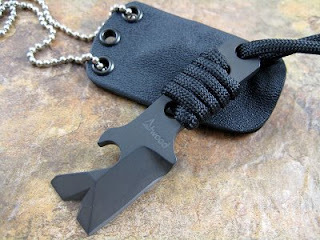 It comes with a kydex sheath with bead chain and also a mini teklok belt clip. Price will be $225 shipped in the US, extra $15 for international shipping and there is only just this one piece. Lottery is over, thanks folks! Howdy folks. Hope everyone had an enjoyable, stress free and safe holiday season! I'm still taking it easy and catching up on paperwork and some odds and ends. Things will be very slow for the next week or two while I take care of some stuff and order new sheets of steel, etc. It takes awhile to gear back up after a big push like I made before the Christmas week. RingTools will not be ready for a little while yet. 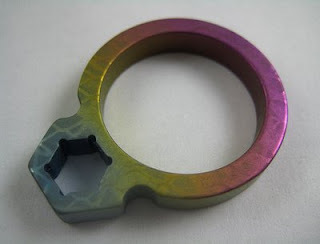 I got them last week from tumbling but they need more grinding and a retumble before I can do the final anodizing, etc. So figure two weeks for them. There is only one hole size for now and it is .838" or 21.2mm. This size will fit medium and average size fingers but probably not the giant mitts of 250 lb guys. I'll be making a second slightly larger size later on this winter. I'm not going to get into a whole bunch of sizes on these because it's a nightmare. They are what they are. The first batch is made of hefty 3/16" thick titanium stock and although I have not yet figured out the final cost I think the price will be reasonable. Ti Rulers are also on deck with the RingTools but I still have a bunch of work to do on them. Hopefully I will get to the ti stuff later this week and get it moving along in the process again. I will be having more lotteries in mid January. I have some more knives to finish and right after I do the prep work on the ti stuff I will get back into sheath mode.